Just went through this article. What's the authenticity? Very unfortunate if true. It has become an unwritten rule that vehicles manufactured in India for India will have key structural components removed. Other countries openly rejecting Indian made cars is an insult to us as a country and hope Government looks into these VERY seriously. Hyundai has been praised continuously in the forum for the build quality and quality of materials used in the interior. But if all the quality is only in the exteriors and plastic parts and if unseen structural members primary for safety is being removed, how much is it going to count? No idea. But it's a well known, sickening fact that many car manufacturers compromise on safety aspects for Third World countries where regulations are poor and/or don't have an independent NCAP (such as India). I bet there's no car on sale in India for less than a million rupees that's as safe as its First World counterpart. There are compromises on either the car's structural reinforcements/number of weld spots, or the quality of metal used. Even in the rare case where either of the above two may not be compromised (such as the VW Polo), the Indian car does not have the same safety features (such as side & curtain airbags, ESP etc.) as its First World counterpart. The only way out is to have an independent NCAP for India. No, the newly proposed safety regulations put forth by the government are not enough. While the new regulations are welcome and definitely better than the crappy ones we have at present, only an Indian-NCAP can do the needful. The Latin American and South-East Asian countries also faced the same issue with manufacturers compromising on safety. But they've made progress and have NCAPs of their own now. While they may not be as stringent as the Euro-NCAP or A-NCAP overall, the Latin-NCAP and ASEAN-NCAP do have the same frontal offset test (40% offset crash into a barrier at 64 kmph) and have indeed made a huge difference to those markets by forcing manufacturers to offer a basic level of safety. 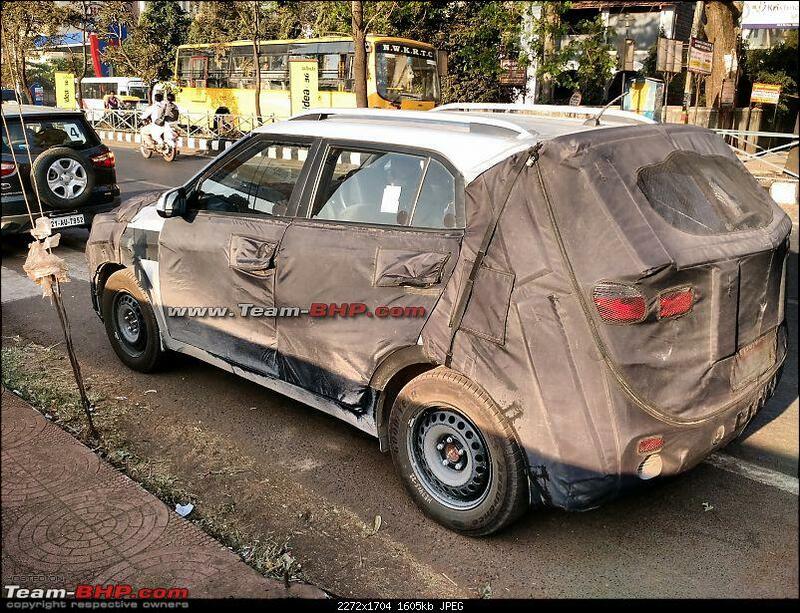 Global-NCAP needs to be encouraged to test many more Indian cars (especially sub-million rupee models) as a temporary measure. But unless we have an Indian-NCAP in the long run, we'll remain behind even Latin American & ASEAN countries on automobile safety, let alone the First World. Last edited by RSR : 14th February 2015 at 23:18. Its true that the crash test results conducted in China for CNCAP or in Euro for ECE do not have any relevance to their Indian versions. But at the same time it doesn't mean that they remove few structural parts in Indian Vehicles. Its just that the steel grades with lower strength (ultimate) and strain percentages are used. Yes its more got to do with no regulatory requirement being mandated for India. We want cars to be cheaper and at the same time safer, companies can't be profitable if they meet both the requirements. By 2018, once the Indian regulatory kicks in, car prices are going to go up north. 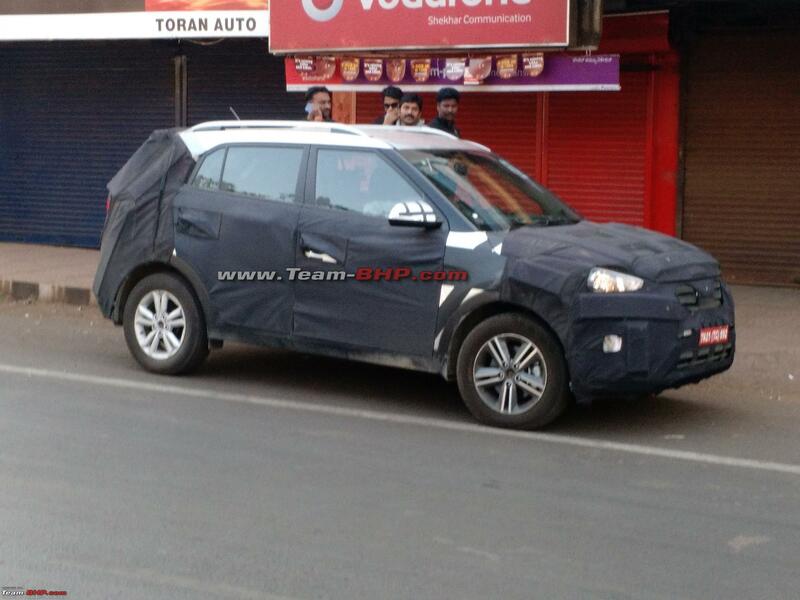 Hyundai has been extensively testing their first compact SUV for India. 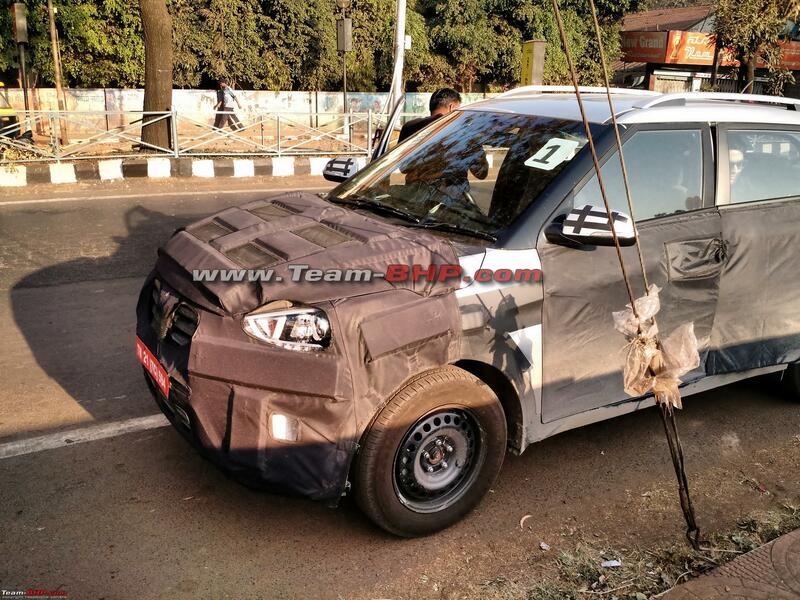 While the launch date is unknown, test mules of the ix25 are being spotted more frequently. Here are a few more images of the small SUV coming in courtesy Vid6639. 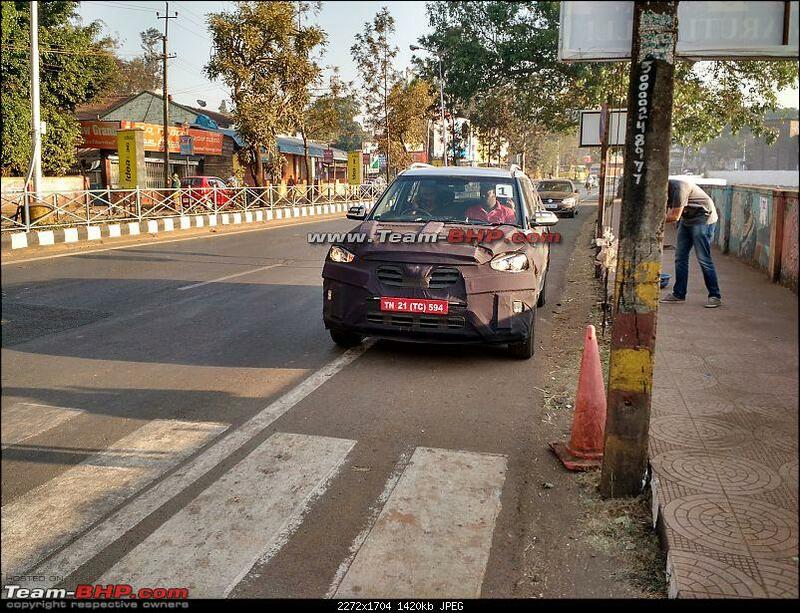 We spotted these test mules inside Belgaum city. 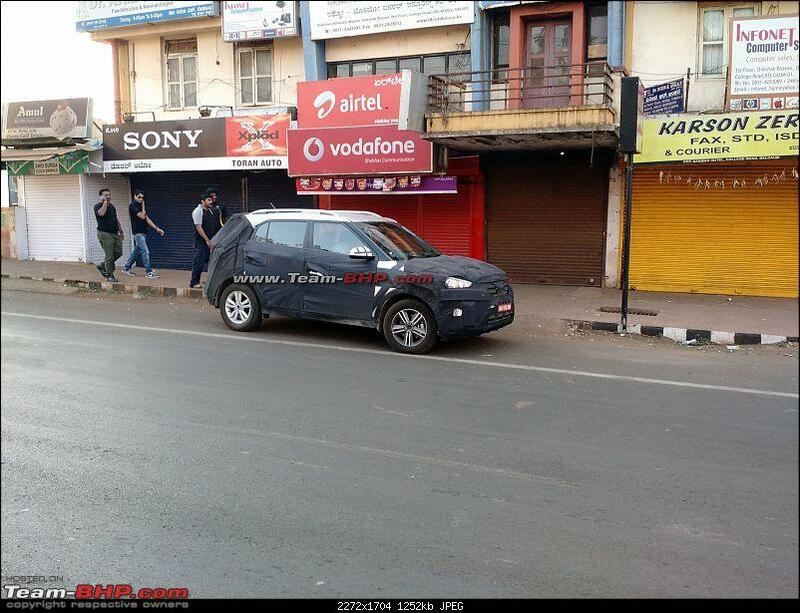 We were heading out of the city when fellow mod Ajmat noticed these camouflaged cars. We followed them till they stopped down the road and took these photos much to the chagrin of the hyundai guys there. 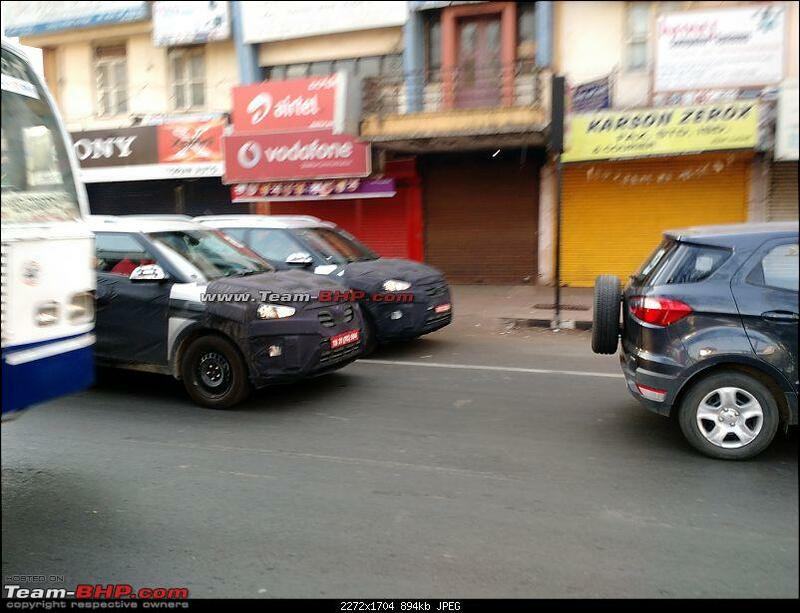 The 2 ix25's were being benchmarked against the Duster and Ecosport which were also part of the convoy. They had projector lamps and LED DRL's. One had alloy wheels of different designs and other had steel wheels. 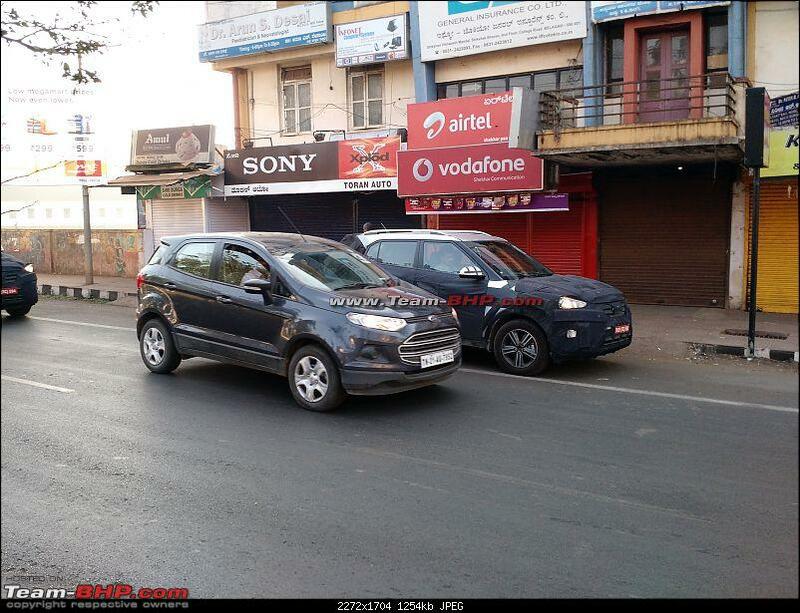 Size wise it is anyday bigger than the Ecosport read not sub4m. The Duster seemed larger. Got a quick view of the interiors and it looked similar to international version photos seen before. Rear had AC vents in the centre console. How about width ? So looks like that not that spacious in the back seat. But a well proportioned stance though. EDIT: The guy in the back seat seems to be struggling to get out? Last edited by ampere : 17th February 2015 at 10:25. Glad you cleared that out. It looks rather small in these images and I thought the Indian spec was a chop-job. This thing is guaranteed to be well equipped. I can sense Renault and Ford sweating already. 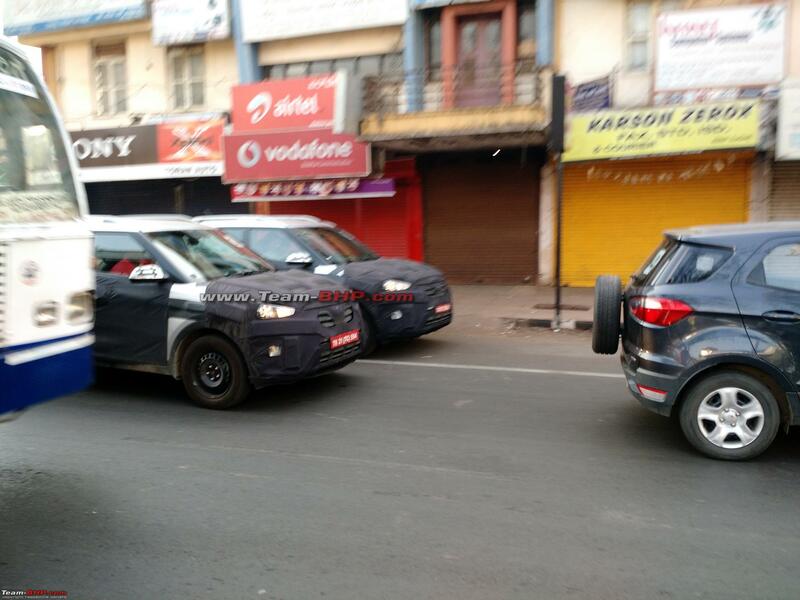 Could you compare the height and width of the test mules to the Ecosport? Are they wider/taller. I am asking because 3 adults at the back seat of Ecosport is not a comfortable fit. Duster OTOH has better shoulder room. 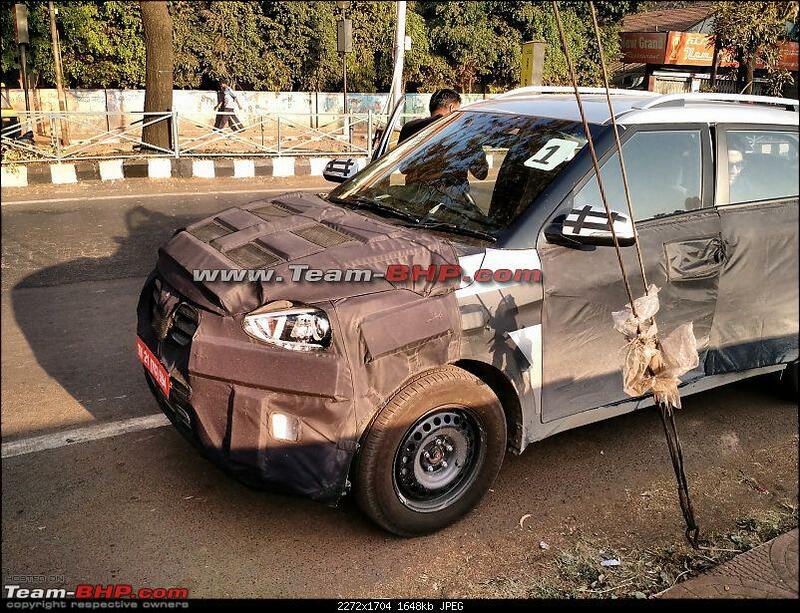 So even if the test mules are longer than 4m, they will still only compare to the Ecosport on interior space and definitely lose out to the Duster. Also in the penultimate picture, the person seems to be crouching in order to get out which seems like the head room too is low. Last edited by racer_ash : 17th February 2015 at 10:47. Front door frame of ix25 and roof-line makes it look like a raised Swift. I hope I am wrong. 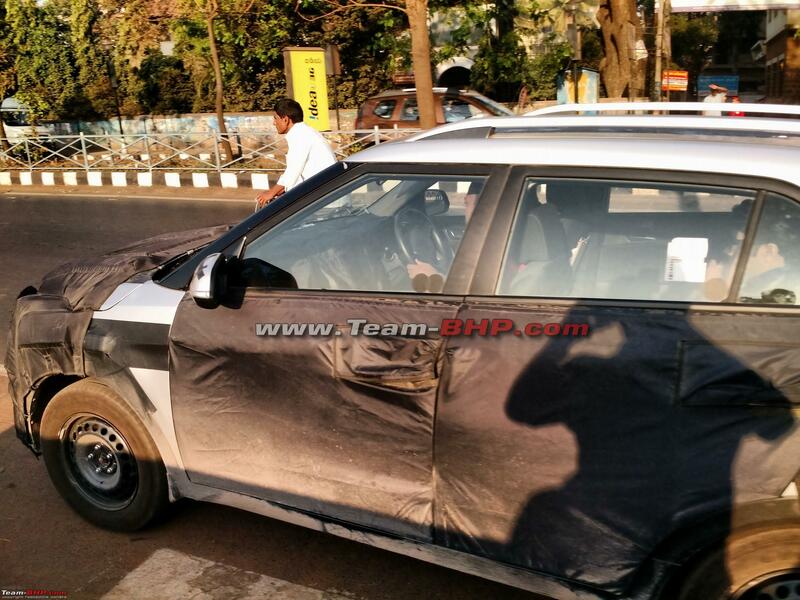 But right now, Ecosport looks better to me. Ecosport looks taller and seems to have higher front seating ( what matters to me ). But one thing for sure, Ecsoport cannot just match ix25 on features front/ Like all Hyundias, this should come pretty much loaded. Well, it looks smaller than anticipated for sure. Especially, width wise I think it has been trimmed down. The last picture shows the gap between the two guys' shoulders as less than 10 inches, which in-turn indicates the back might not be able to accommodate the 5th adult in comfort. 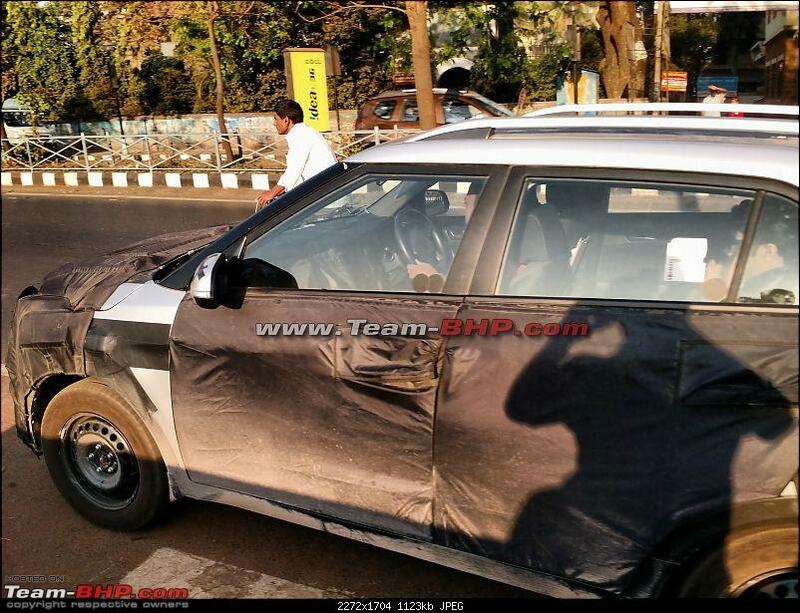 I expected ix25 to be a comfortable compact SUV but its not looking good from the pictures. As someone mentioned, the A pillar looks a straight lift from Swift / Cooper. Width wise it looked lesser than Duster but more than Ecosport. As I said, it slots in between. The rear legroom though looked quite decent. Perhaps more than the Duster. 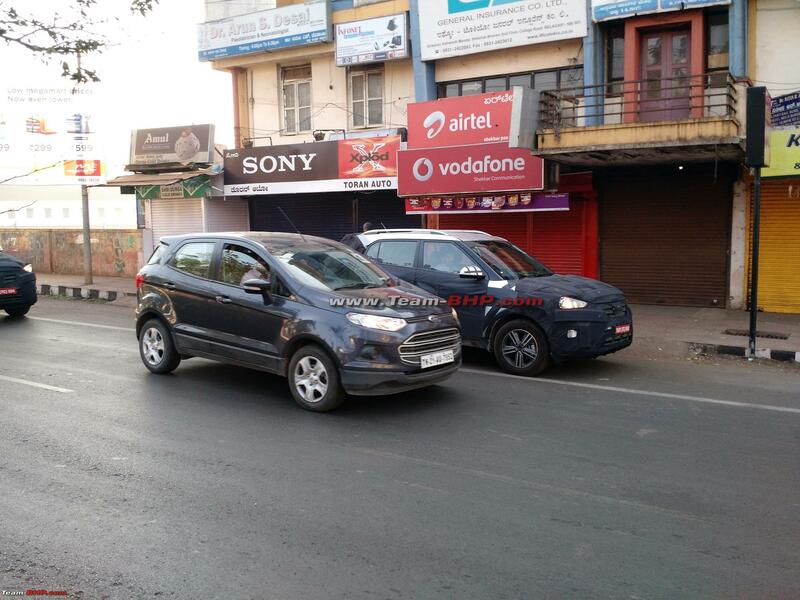 Height wise very close to the Ecosport. The rear headroom was not less by any count. 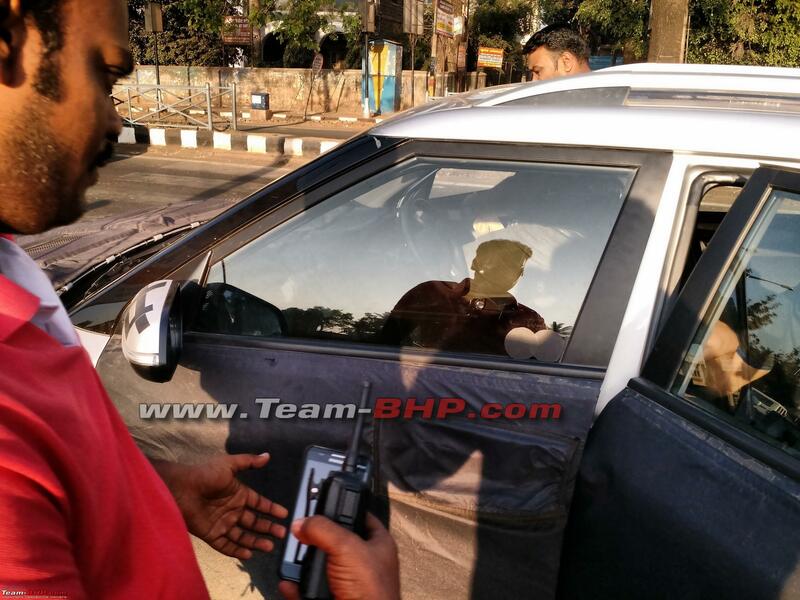 The photo shows the guy getting into the back in such a way to ensure the rear door doesn't open wide for us to take a peek inside. There was no crouching business. The rear window glass area looks small. 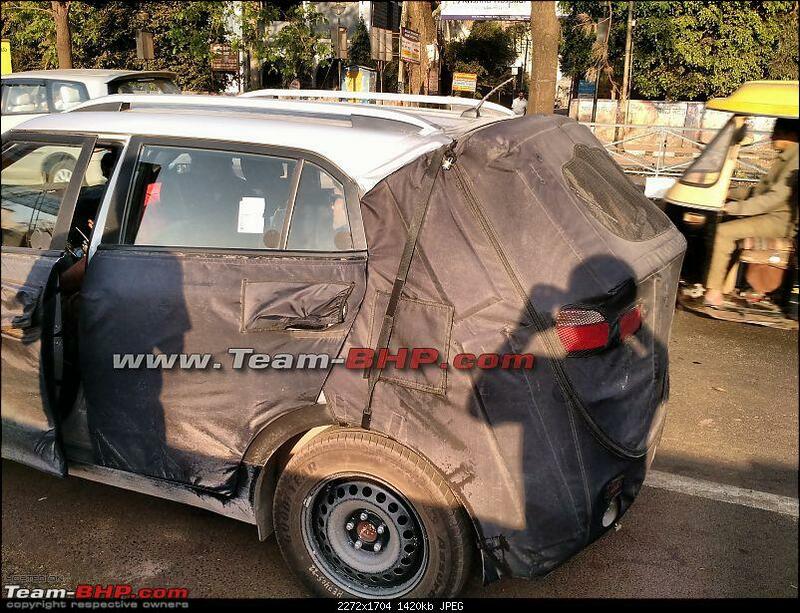 Hope it will give decent rear space and boot. I am eagerly waiting for this one. Do not know why Hyundai is bringing a size in between Duster and Ecosport, when they do not get the sub 4 m benefit. 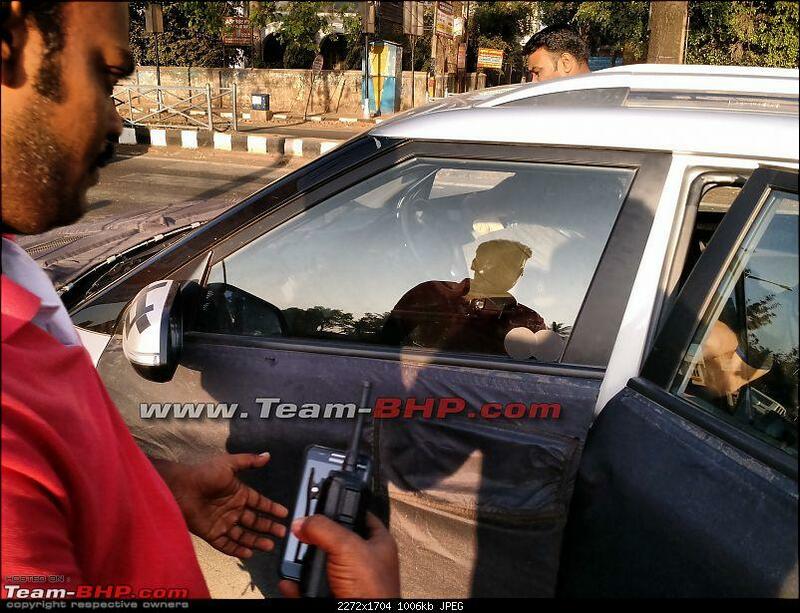 The photo shows the guy getting into the back in such a way to ensure the rear door doesn't open wide for us to take a peek inside. There was no crouching business. As an aside, we spotted the IX 225 and decided to chase. Viddy and Suhaas jumped out and started clicking at close range. The Hyundai folks were pretty irritated and admittedly, we spoilt their tea break. They got quite stroppy and fled. 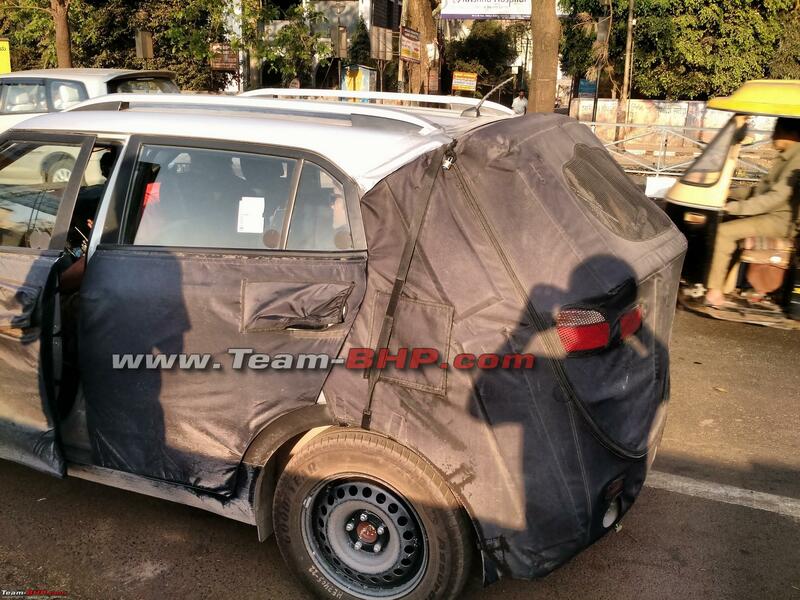 From the front view ground clearance doesn't seems to be more. Here's a quick question on the spare wheel? Whats going to be the plan is it going to be plonked at the back or under the car? Since I havent come across any photos with the spare wheel at the back, I presume it to be under. How could the car look if its plonked at the back? ?